Check out these tips for winterizing your wooden, aluminum, or vinyl fence. It’s that time of year again when you’ll have to start thinking about preparing your home for the harsh conditions of winter. This includes preparing your wooden, aluminum, or vinyl residential fence to endure the cold in the air and the moisture in the rain and snow. Follow these tips for winterizing fences of different materials. Everyone knows that wood is a natural material and that it absorbs moisture. This means that it’s susceptible to a lot of damage in the winter, including sagging, swelling and cracking, and even breaking. Before winter arrives, give your wooden fence a good and thorough inspection on a dry and sunny day. If you notice anything that needs immediate attention, be sure to address those issues now before winter arrives. Also, remove and replace any damaged sections and use wood putty to fill any cracks and gaps that you find. 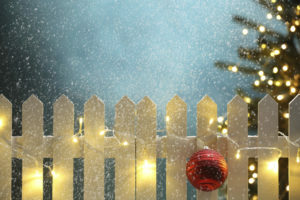 Next, clean and stain or paint your fence so that it’s ready to handle winter’s worst. Although aluminum fences are more durable than wood, they still require some care and attention. Keep an eye out for rust. If you find any, use a scrub brush to scrub the rust away. If your fence looks a little dull in any areas, use an aluminum-surface paint to bring some life back to it. To get it ready to endure the winter weather, use a rust protector especially on the hinges and powder-coat the fence to give it some longer lasting durability throughout the upcoming season. Just like with a wooden fence, home or property owners that have vinyl fences should give it a good inspection to check for any missing or broken boards, or other loose or damaged parts that need to be fixed first before you can move on. Although vinyl is one of the most durable options for fencing available, it is susceptible to damage from environmental incidents. Before the winter, give it one good final cleaning which should include power washing any mold off the surface. Make sure that all parts are where they should be and secure. This entry was posted on Friday, November 9th, 2018 at 12:45 pm. Both comments and pings are currently closed.